Should You Get a Diesel Mower? Just a few years ago, there was a massive gulf between gas and diesel-powered mowers. Diesel engines offered more power and better fuel efficiency but came with a hefty price tag. Today, that gap is closing as manufacturers have introduced fuel injected gasoline engines. Are diesels obsolete, or do they still offer superior performance? The energy created by burning fuel comes from breaking molecular bonds, and diesel has bigger molecules than gasoline. As a result, a gallon of diesel has more potential energy than a gallon of gasoline. All things being equal, a diesel engine should use about 10% less fuel than a gas engine. Diesels are even more fuel efficient due to their design. Diesels use compression ignition, squeezing the air/fuel mixture until it gets so hot it explodes. These engines use a high compression ratio to get compression ignition with each power stroke. Gasoline engines use spark ignition, lighting the fuel to create detonation. The compression ratio in these engines is low to avoid compression ignition. A higher compression ratio results in improvements to the air/fuel expansion ratio, intake velocity, and exhaust velocity. While you may need to be a professional engine builder to understand how these factors work together, they all come down to one result: compression ignition engines are a lot more efficient than spark ignition engines. On average, a 25 hp diesel will burn around one gallon of fuel per hour, while an equivalent carburetor-fueled gasoline engine will use 1.5-1.6 GPM and a fuel injected engine uses around 1.2-1.3 GPM. That means a diesel will use ¾ of the fuel of the best gas mower. How much can you save on fuel costs? That depends on the price of fuel where you live. Here in Pennsylvania, diesel is usually $0.50 per gallon more than gasoline, but it’s only about $0.30 more if you cross the border into Virginia. The savings can vary widely depending on this price difference and the total price of fuel, but even in the worst case scenario, you’ll spend less fueling a diesel mower. Old gasoline will either cause corrosion from gasoline blended with ethanol or varnishing from ethanol-free blends in carburetor-equipped engines, while fuel-injected engines are usually fine as long as the fuel is stabilized. Water contamination and algae growth can be a problem with diesel, but only if the fuel is improperly stored. Fuel can be left in a diesel engine for up to 6 months before any preventative maintenance needs to be taken, and that’s usually limited to running the engine long enough to flush old diesel out of the fuel lines. This is easy to overlook, but it’s the biggest benefit when buying a diesel mower. Horsepower is a measurement of work over time, and in this case, “time” is RPM. Gasoline engines make power at higher engine speeds than diesels, so they have higher horsepower ratings than an equivalent diesel mower. As with gas mowers, you can expect companies to match the output of a diesel engine to their equipment, even though on paper a diesel may seem less powerful than a gas engine. With a wider torque band and more low-end torque, a diesel-powered mower will be able to maintain blade speeds better than a gasoline engine. This is especially noticeable on mowers with 60 and 72-inch decks. Owners often report being able to climb slopes with the blades engaged where in the past their gas-powered mowers would only cut when driving downhill. Fuel injection, better air filtration and improvements to lubrication and cooling systems have increased the life of commercial gas engines, but that also makes repairs more expensive. Diesels have always had higher repair costs, but they also have a reputation for long-term durability. It will be years before we understand how far new gas engines have come when it comes to reliability, but buying a diesel is a sure thing if you want to put as many hours on your mower as possible. In the past, a diesel could easily cost a third more than an equivalent gas mower but again added complexity has closed the gap. Depending on current sales and financing options, the premium for a diesel may not be that much. Factor in fuel savings and the return on investment can be far shorter than the term of the loan. We’re a certified dealer for several diesel engine and diesel-powered mower manufacturers including Kubota, Scag, Exmark, Woods, and Yanmar. If you’re looking to add a diesel to your fleet or need your current mowers serviced, visit our shop at 4900 Molly Pitcher Highway in Chambersburg, PA. Need parts? We ship across the U.S. and Canada. To order, go to our website, www.shankslawn.com. 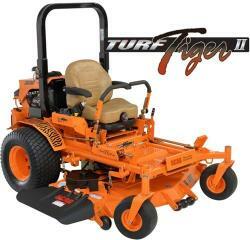 This entry was posted in Uncategorized and tagged Diesel Mower, Mower comparisons, Shank's Lawn. Bookmark the permalink.